With Thanksgiving just around the corner I am practicing on my side dishes. I was shopping at Trader Joe’s and I saw these beautiful petite colored carrots. I thought they were just adorable, so I had to buy them. If you shop at Trader Joe’s and you are in need of carrots, check their’s out. I debated on how to cook the carrots, and one way I love carrots is roasted. 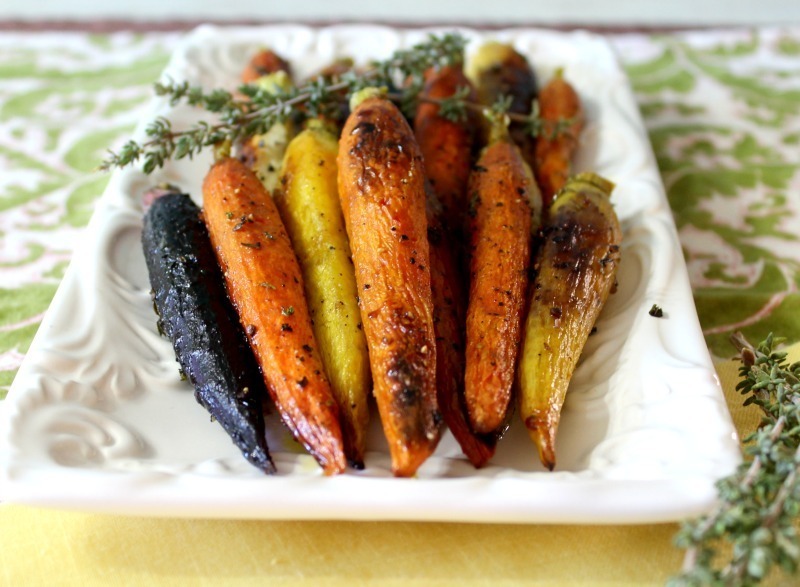 Something about roasting carrots brings out all of the flavors and gives it a nice rustic look. 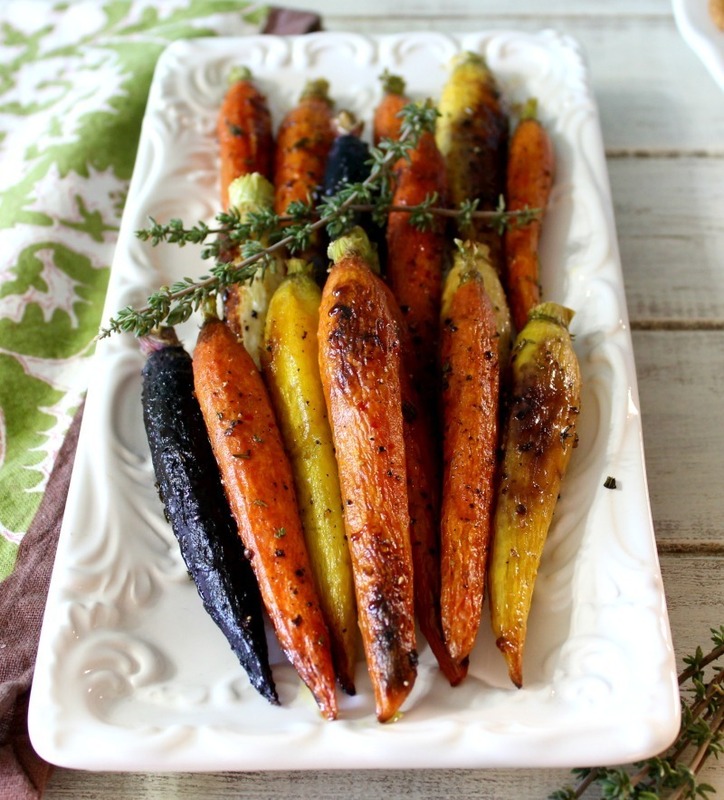 Today I have for you Caramelized Herb Roasted Carrots. These carrots are simply amazing. They have it all! They are naturally sweet, but I made them a little sweeter by adding just a pinch of brown sugar. They are slightly savory from the salt, pepper and fresh herbs. I used fresh thyme from my garden and rosemary. Just simply delicious. This recipe is super easy to make. 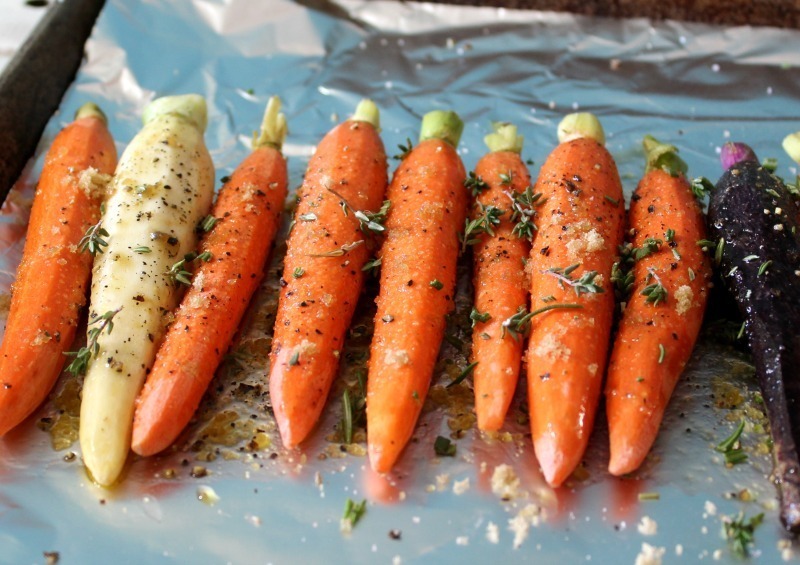 I added my carrots to a baking sheet, drizzle a little bit olive oil, salt, pepper, brown sugar and herbs. Bake in the oven for 25 – 30 minutes. You will hear them sizzle in the oven. Half way through cooking, I did flip them. My oven doesn’t cook evenly, so flipping them is a must. Here is a picture of them before going int he oven. 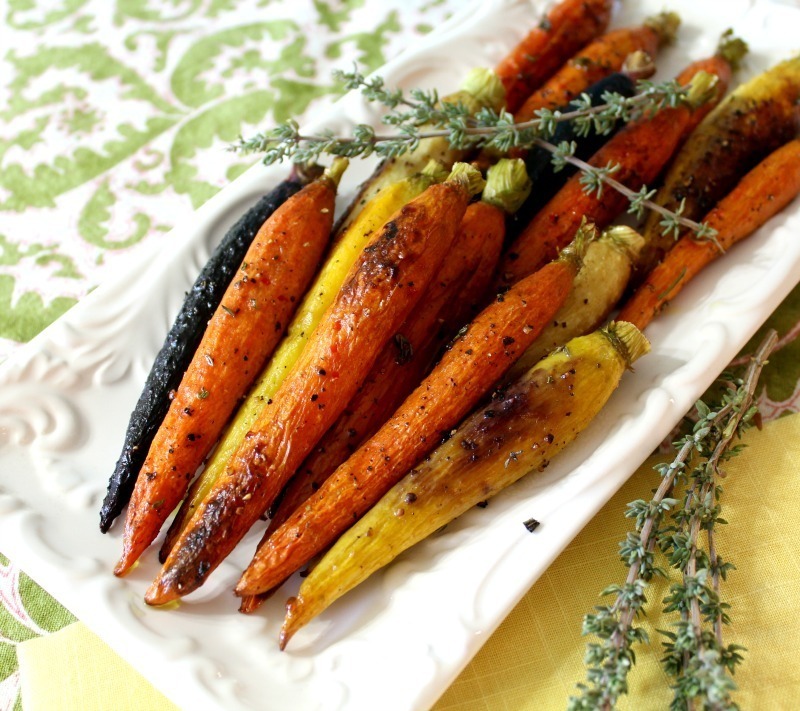 These carrots make a great side dish with just about any meal. I will be serving these on Thanksgiving. They should please every one of your guests because they are vegan and gluten-free. But the best thing is they taste great. They even taste yummy cold. I’ve been munching on them. One thing about this time of year is all the time and prep cooking. Who has that kind of time? What is nice about this recipe is that they look like you spent a lot of time on them. Prep is 5 minutes, max, and just popping them in the oven. Serve on a pretty platter and you are good to go. 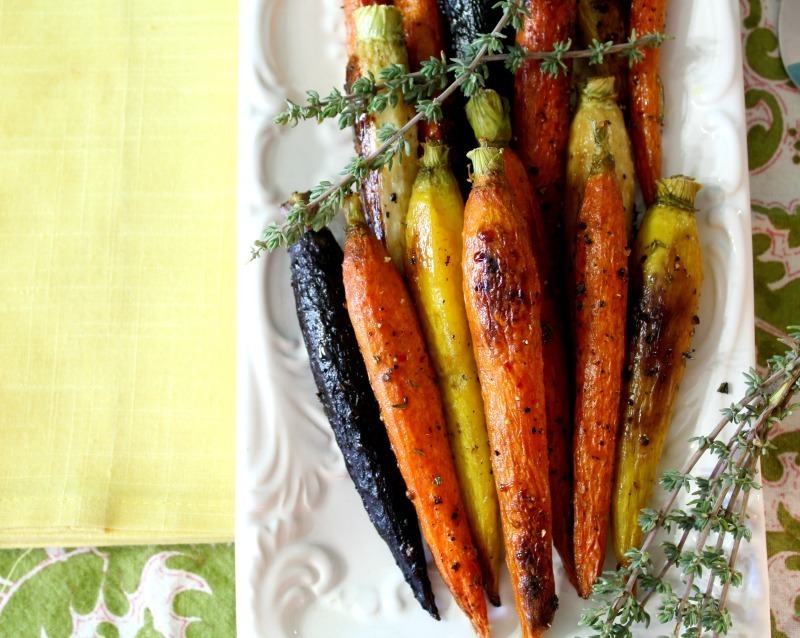 If you do not have petite colored carrots, you can use any carrot. Just be sure to peel them and cut them into the same size. If you have them the same size, they will cook more evenly. 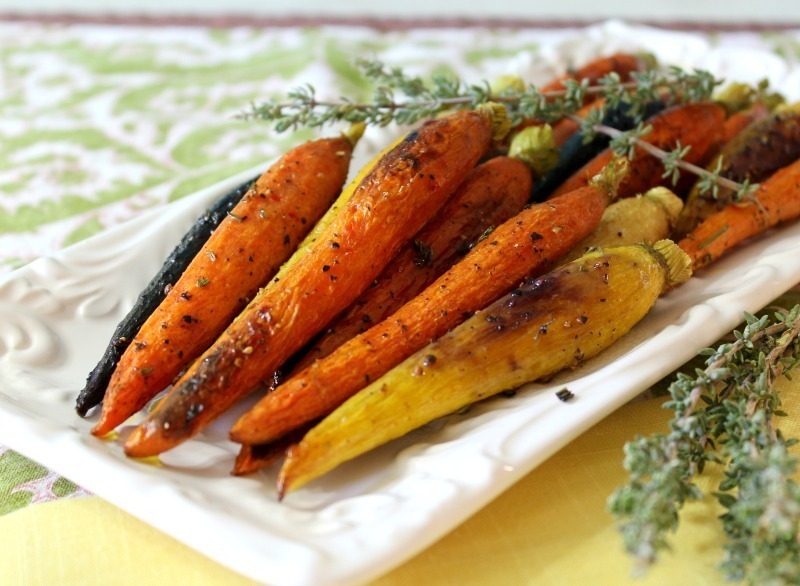 Tender, petite oven roasted carrots with olive oil, fresh herbs and brown sugar. Slightly sweet and a little savory, such a wonderful combination of rustic flavors. Bake in oven for 25 - 30 minutes, until fork tender. Flip half way through cooking. Note: make sure the carrots are all the same in size for even cooking. If they are thick, it will take longer. Just what I was looking for.. these carrots look so delicious. Thanks for the recipe! Thank you!! Let me know how they are if you try the recipe.